More schools should keep children in at lunchtime to stop them "roaming the streets", the government says. The School Standards Minister, David Miliband, said he had been encouraged by innovations in some schools aimed at tackling bad behaviour. He told the Secondary Heads Association conference that children needed an "ethos of respect and achievement". He praised Swanlea School in London, for ending "the tipping out onto the streets at lunchtime". Instead, he said, it had "pupils in school, all day, no exceptions, end of story". Head teachers support the idea. They say they prefer to keep children in - especially the younger ones - but it is expensive because of the need to pay for supervision. 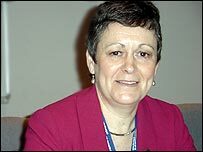 The president of the SHA, Anne Welsh, said the bill for supervision at her school in Newcastle upon Tyne was £40,000 a year, but she preferred to keep children in at lunchtime. Letting them out often brought problems with the local community, she said, because people felt intimidated by a big group of teenagers. "If they are allowed out in the community at lunchtime, you can spend most of the afternoon dealing with the consequences of incidents," she said. "It's constant hassle. People are on the telephone saying pupils dropped litter or were rude to someone. "Sometimes people, especially older people, feel intimidated just because they are teenagers who may not be doing anything wrong." 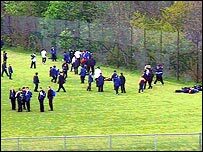 Kate Griffin, who is the head teacher of Greenford High School in London and the former president of the SHA, agrees it is better for community relations to keep children in at lunchtime. "A few shops and 1,000 children is a recipe for disaster. The children quickly squeeze out the other customers." David Miliband said: "Of course children need a break at lunchtime. But they don't have to be out of school, roaming the streets, to do it." Some children could handle the responsibility of going out of school, but others could not, he said. "They end up playing truant or get into trouble with the local community." He said that at Swanlea School there was a lunchtime programme of activities, including sporting activities, language and literacy classes and mentoring from local business people. Later, he told journalists: "Heads say they are always spending time herding children back, no matter how good they are. "There is a rhythm to the day which should not be broken." Mr Miliband was given a warm reception by the head teachers. In his wide-ranging speech he had paid warm tribute to them, saying they had delivered strong advances in school standards over the past six years. "Schools are the most powerful and enduring engines for good in our country. "There are plenty of people ready to run down what you do. I want to stand up for what you do, for the good things happening in schools around the country, for the difference I have seen your schools making to the outlook of students, for the care and motivation which changes lives." Six times in his speech, David Miliband referred to what he called the "Blair generation", who he said had benefited from "successive waves of innovation and investment in primary and secondary education". There were no excuses for this generation, he said.